As Disneyland continues its 60th anniversary celebration with diamond giveaways and spectacular merchandise, another milestone was noted in early February but with much less fanfare: Disney California Adventure celebrated its 15th anniversary. As an opening cast member that day in 2001, it's hard for me to fathom it's been that long, or maybe it's just hard to know I'm 15 years older. To commemorate this occasion, lets revisit the past and catch up with the present. The concept of the second west coast Disney theme park was originally introduced in the early 1990s as WestCOT, the counterpart to Walt Disney World's Epcot. That idea never passed the concept stage, and in 1995 Disney CEO Michael Eisner assembled a team who proposed the California theme park. Three years later, construction began on the site of the original Disneyland parking lot. Disney's California Adventure, as it was then called up until the rededication in 2012 as Disney California Adventure, celebrated the theme of the 31st State. 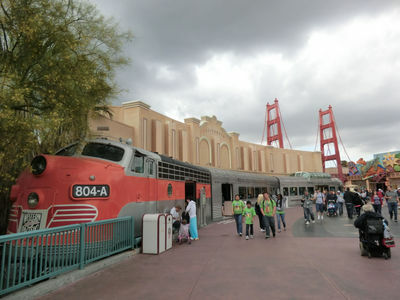 It was divided into four main areas: Entry Plaza, Hollywood Pictures Backlot, Golden State, and Paradise Pier. Everything about the new park screamed California, especially the Entry Plaza, which was designed to resemble a giant postcard. This area welcomed guests through the gates and included 11-foot high letters spelling out California. The California letters were one of the most sought-out locations for photos. The themed overlays, like candy cane striping for Christmas, were especially popular. MousePlanet file photo. Imagineers paid homage to the state with subtle nods found throughout the park. Maliburritos, and Hollywood and Dine eateries, Mulholland Madness, and Orange Stinger attractions, and my favorite Bur-r-r Bank Ice Cream. Bur-r-r Bank Ice Cream was housed in an orange and silver California Zephyr shell. MousePlanet file photo by Adrienne Vincent-Phoenix. Every cast member has some great story about working in the theme parks, and being part of a new park's grand opening is even better. Now, I cannot divulge all my Disney secrets or I may find myself in jail with the pirates waiting indefinitely for the dog to bring us the keys, but, I can share a few fun memories. As cast members, we volunteered regularly for attraction test runs and new menu offerings. Sometimes attractions didn't quite go off as planned. On one such occasion we hopped aboard the newest adventure—Soarin' Over California. Originally, odors were released through the attraction to match the corresponding visual—pine scent for the forest, suntan lotion for the beach. During this run through, the only smell working was the orange scent (for the orchard scenes) and it permeated throughout the entire attraction. We were smelling citrus all day. My favorite memory is from one evening when a co-manager walked into our office laughing. It seems one of the animatronics on Superstar Limo in the Hollywood Backlot Studios had her head turned around and it was stuck. Ah, show business. On February 8, 2001 Disney's California Adventure opened its gates to the public and cast members waited in anticipation. And we waited. And waited. Guests would come into the stores asking "Where is the Disneyland Railroad? ", or "Where are the characters?" After hearing the same questions every day, something became apparent to the Disney team—Disney's California Adventure was not meeting expectations. Changes began, and quickly. Stores no longer carried specific location merchandise—the same product could be found at all the shops. Characters appeared all of a sudden—Mickey, Minnie, and friends were "on vacation" in California. Who Wants to be a Millionaire? made its way to the Hollywood Backlot. And surprise, Main Street Electrical Parade called DCA its new home with a few alterations including a name change to Disney's Electrical Parade. Slowly over time with a few more changes, including A Bug's Land for smaller guests, the crowds started to show. Throughout the course of the first decade, Disney's California Adventure experienced its share of growing pains. Wolfgang Puck and Robert Mondavi both ended their sponsorships, as did McDonalds. The agricultural area of Golden State was redesigned with the opening of A Bug's Land, which included a sprinkler system to entice guests on hot days. Lack of shade on the boardwalk was also a major concern in the early days, so new sun shades went up. Maliboomer, a thrill ride that shot guests up in the air, was dismantled in 2010. Two years later, the park had a major refurbishment with the addition of Cars Land, and the park's new E-ticket attraction Radiator Springs Racers. The Entry Plaza disappeared, and in its place rose the vision of Hollywood when Walt Disney came out west in the 1920s: Buena Vista Street. 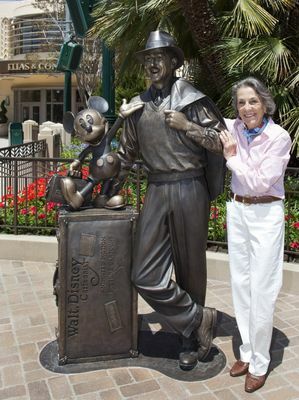 Walt Disney's daughter Diane Disney Miller poses with the "Storytellers" statue of Walt and Mickey, which is the centerpiece of Buena Vista Street. Photo ©Disney. And DCA is still changing. The Hyperion Theater's Aladdin: A Musical Spectacular took a final bow in January to make way for the Frozen – Live at the Hyperion show opening later this year. Earlier this month, Luigi's Rollickin' Roadsters opened its car doors for guests. Fifteen years have come and gone at Disney California Adventure; with some tweaking and tucking here and there, the park has finally found a personality (mostly). I'm still not sure why The Little Mermaid – Ariel's Undersea Adventure sits in the middle of the park or how her story fits. But, for those of us who experienced the work behind the scenes of opening a brand new theme park, it will always hold a special place in our lives. So, I'll take my 15-year birthday button, grab a smoothie from Schmoozies and head on over to California Screamin' for a celebratory ride. Happy 15th birthday, Disney California Adventure. We love how DCA has changed over the years. When it first opened, we had friends who went there and really didn't like it. We went in 2006 and the only part of the park that we liked was the new Tower of Terror (which wasn't/isn't as good as it's WDW counterpart), and Bug's Land. What? Bug's Land??? Yip. We liked it because it fit what Disney Parks was all about...the theming. After that trip, we took 5 trips to WDW before returned in 2013. It was on that trip that we began to love DLR...because DCA was finally a "real" park. After two subsequent long trips to Anaheim, and even an AP year filled with many little trips, we can say that DCA has helped make DLR into a resort that keeps me from traveling across the country to Disneyland's big sister. Here's hoping that it continues to grow and become even better. What I remember most from the first year? A drum-and-bugle corp dance troupe. -- I thought to myself, "They have taken the concept of 'the all-American band' and put it on steroids!" -- A very 21st century format. I first visited DCA in December 2004. I had an absolute blast! I had wanted to eat at the Soap Opera Bistro on the General Hospital set, but the restaurant was already gone. I stayed at the GCH and was upgraded to a theme park view room. Absolutely wonderful. Especially enjoyed discovering what would become two of my favorite DL watering holes......the Cove Bar and Hearthstone Lounge. Last visited in October 2013 and found the park as enchanting as ever with the addition of Carsland. Loved dining at Carthay Circle and Napa Rose. Can't wait to go back! I have seen both the original and the current version of DCA and I have to say I love the new DCA way better than the old. It does have a Disney feel even though it is not DL. I look at Mermaid as fitting in with the Paradise Pier theme. MK has a much better queue with Prince Eric's castle. Buena Vista Street, Cars Land and now the whole Grizzly Peak area stand out as the best parts of the park to me. Soarin's recent change made a great area even better with the national park theme. Some people still complain about Paradise Pier but I think it has a bit of charm even though it did not fit into my list of favorites. Happy Birthday DCA!